In this blog I will look at how you can create a website free of cost and talk about the best free website builders available. There are many companies out there offering free websites, but how many of them are actually free? Want a Website free of charge? 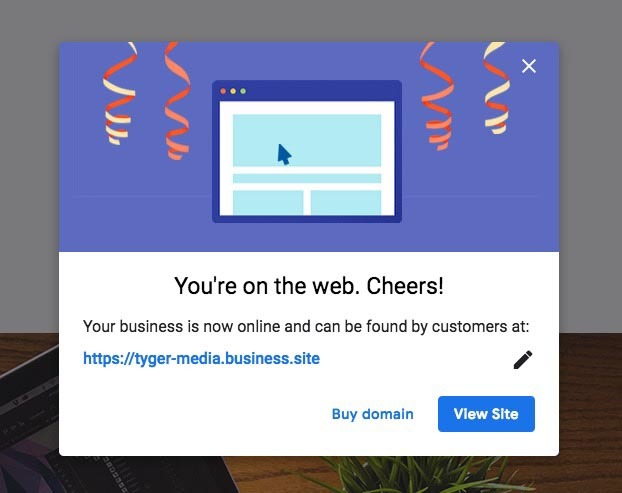 The first option is Google my Business https://www.google.com/intl/en_uk/business/how-it-works/website/. 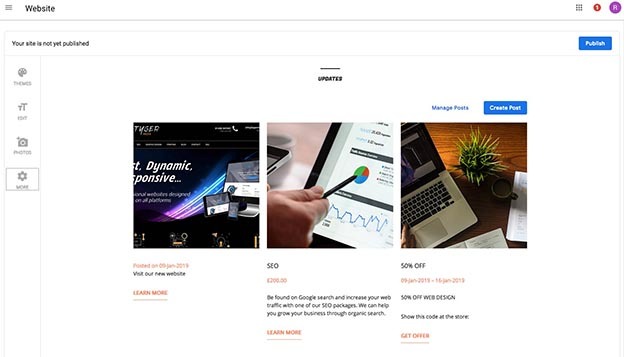 Here Google allows you to create a free website for your business in under 10 minutes. The first thing you need to do is set-up a Google My Business account and enter your company details. You may be required to prove you own this business before you can start, but this doesn’t take long. Once you click on the website tab, Google automatically pulls your company information into one of its website templates. You can then simply click through the templates to choose the one you like. You can edit the main image by uploading your own. How to add content to your website. Your offers are automatically added to your website and editable sections are added for your Services, About, Gallery and Contact. A nice large map shows at the bottom with very clear phone number, address and opening times, with clear calls to action. Once you’ve finished editing, simply click the publish button and that’s it. Your free website is now live. What are the other options for getting a free website? The second option is WordPress.com where you can build a WordPress.com website for free. WordPress offers a wide range of theme templates for your website on which you can edit the colours, background styles and fonts. 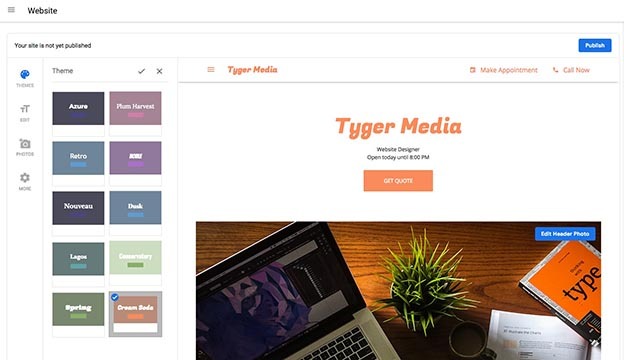 There are Premium themes available which will make your site look even more professional, but thee cost money, so if you choose one of these your website will not be free! Your website can also include a blog, meaning you can add content to keep your user coming back and also help with your site’s SEO. All you need to do is sign up and you can start building your website straight away. What about the free website builders like Wix? These website builders are fairly simple to use and generally you could build a website using one of these within a day or so. They also offer responsive design so your website will work on tablets and mobile devices. However, my experience of these is that they are that the mobile functionality is not great and they can be quite difficult to use. Although they claim to be free, many have premium options which can be expensive. Yes you are getting a website for free, but with all of the options above there are pay offs. The Google My Business website is completely free, there are no catches, however they are very limited in terms of design options and functionality. I hope to see Google improve this soon. 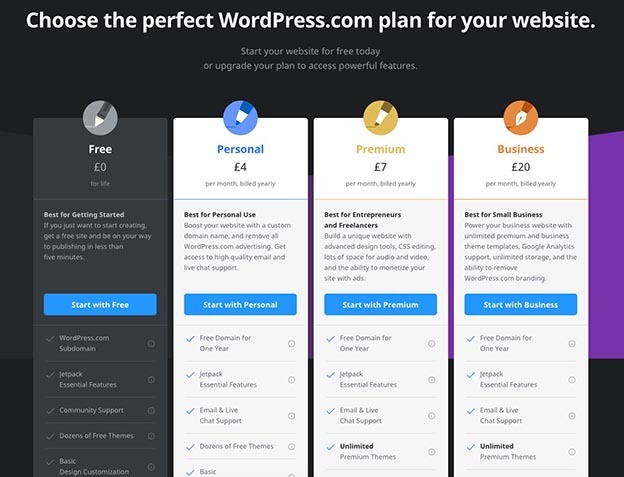 WordPress.com websites for example are free, however your domain name will be something like: your company.wordpress.com and your site will contain other peoples adverts. The website builders such as Wix work reasonably but you may find that the costs suddenly start to creep in after 12 months, so they are no longer free. Overall, all of these give you a website for free, or for very little outlay. However if you are looking for a professional looking website which you have complete control over you may be better off employing a professional website design agency.